If you are getting tired of ups and downs hiking through mountains, you can have a taste of "downs and ups" hiking through canyons - the miracles resulting from uplifts, volcanic depositions and eroding effort of ancient water. Sprawling along HWY12 which lead you to the heart of Bryce Canyon, you would be amzaed by the crystal-white snowfields even in early summer. Within an hour, the scene turned dramatically into brillant red canyons, contrasted against the bright blue sky. 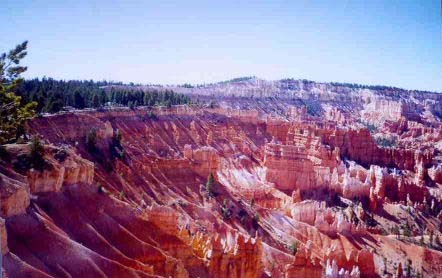 Bryce Canyon is piece of "Ruby" hidden in the Utah. 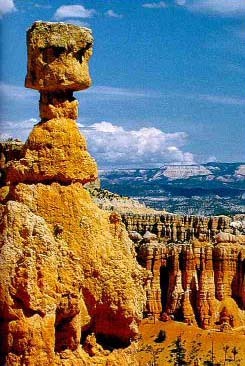 There was once a rumour among the ancient Indians that the bright red hoodoos were thousands of evils trapped by curse. However, what you hear in any part of this national park is no longer curse, but exclains. Before you reach the Bryce Canyon National Park Visiting Centre, Fairyland Point gives you an appetite and overview of the amphitheatre. Whether the Fairyland Characters are alive or not, they are definitely dazzling. You could appreciate this "Ruby" and its neighbouring plateaus and landscapes from different angles at various viewpoints (Sunrise Point, Sunset Point, Inspiration Point, Bryce Point, Paria View, Fairview Point, Agua Canyon, Ponderosa Canyon, Natural Bridge, Rainbow and Yovimpa Points). But you would surely regret if you don't walk down the rim andget into hugs of the hoodoos. The most beautiful trail is the Queen's Garden Trail between Sunrise and Sunset Points. Shortly after departing from Sunrise Point, you will be mixed into the fascinating sculptures by the nature. You can dance among those colourful hoodoos , and pass under the natural arches bridging the trail. The, you will meet Thor's Hammer where you could choose to continue your hike round the Navajo Loop Trail to the Wall Street or ascend back to the canyon rim at Sunset Point. It was so unfortunate that dark clouds began to aggregate near the end of the day which mask the sunset and dusk scene. After a chilly and smowy night, we had to leave this lovely place with a tint of pity. We drove south along HWY89A towards Arizona. This scenic drive made hours of driving enjoyable and worthwhile. 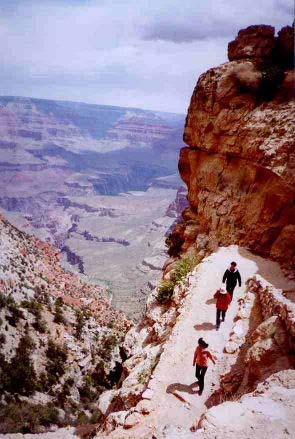 The way to Jacob Lake and North Rim Entrance of Grand Canyon would not open until mid-summer. We crossed the east extreme of Grand Canyon via Navajo Bridge which hangs over the rapidly running Colorado River and came to its south rim. It's this powerful and energetic river that carved the Grand Canyon into its North and South parts. I could use hundreds of words to describe the fantasy of Bryce Canyon but there is no single word I can find suitable enough to describe the grandeur of Grand Canyon. You may take thousands of beautiful pictures there but none of them could truely represent the feel of how pico and humble you are in it. We entered the Grand Canyon National Park from its East Rim. Immediately, the Desert View trapped our sight. 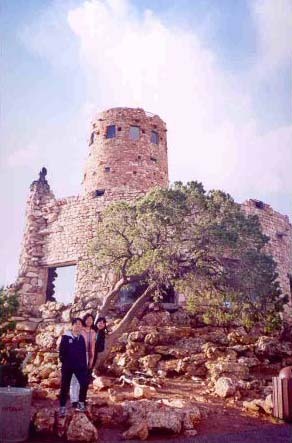 It is the highest point of South Rim where the ancient Indians built an observation tower there for defense and storage. 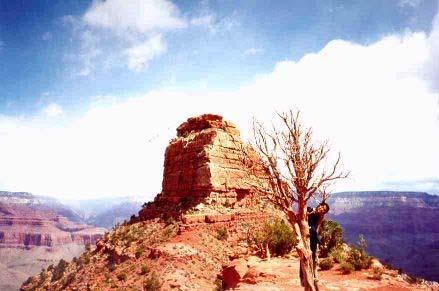 Nowadays, you can get on the top of the tower between 9am and 5pm to have a panoramic view of the canyon, palisades of the desert, and Navajo Indian Reservation. A Kiva is also exhibited inside the tower. 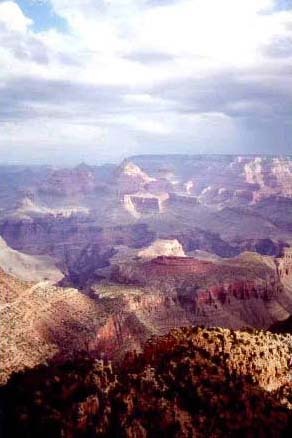 Travelling along the south Rim, you can enjoy spectacular scenery at numerous viewpoints. From time to time, clouds and sunlight fight for their dominance, adding colours and life to the canyon. At dusk, sunlight faded, took away its luster on the rocks, left behind a mystery purple glow. 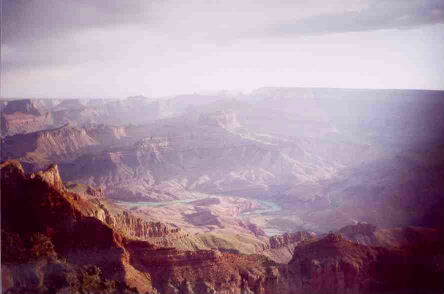 The urge to get closer and explore the canyon distended within our hearts. 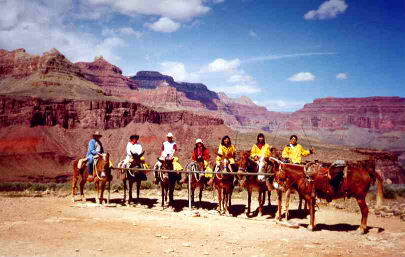 We joint a one-day mule-riding trup to Plateau Point on the Bright Angle Trail. We had great fun on mule-backs apart from enjoying the views. I would, however, advise against hiking on this trail due to the relatively crowd and dusty environment. 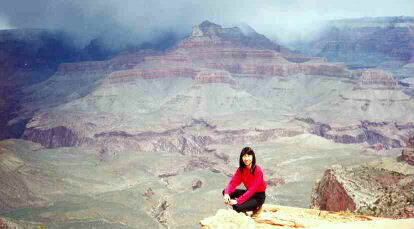 We took the South Kaibab trail for a day-hike. After half and hour's walk down the Zig-Zag path, we reached the Ooh-Aah Point, named after the exclamations heard there about the great view. Further down, the scene changed from thrilling views of cliffs to calming views of plateaus. The weather became warmer and warmer as you descend. We shed our layers and rest at Ceder Ridge. Extending from this point are sheets of brillant red rocks like a licking tongue to taste the atmosphere of the canyon. Then we came to the O'Neili Butte where a strange profile of square blocks of rocks stands. 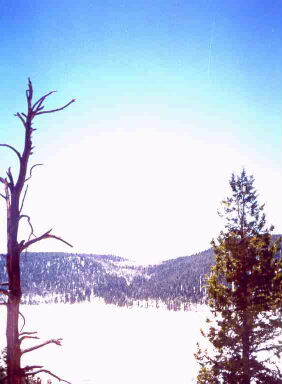 The trail leads you down to a large plateau and finally the Kaibab Sunspension Bridge over Colorado River. A return trip up to that point takes 2 days and you need to apply for backcountry permit to stay overnight inside the canyon. For us, we had to went back up to the rim before sunset. Ascending is more strenous than descending but once there is "down", there must be "up", no matter which goes first. ----- That's life !